Click the image to see a larger version of this tree. 10. The character Big Lewis was created purely as a tribute to my lace-tatting, spoon whittling cousin of the same name. 11. Althea‘s middle name, Frances, is in tribute to Carrie Frances Fisher. 12. Selma is named in honor of two cousins who both greatly supported my writing. My cousin Bubba’s real name is Anselm, and his sister Gerry was given a boy’s name. When I started writing this, Bubba told me the feminine version of his name was “Selma“, so Selma was named jointly in their honor. 13. My grandparents, Mac and Myra Ware, had four girls before they had their son. According to family legend, my grandmother liked the name Phoebe if their fifth child ended up being another girl. 14. 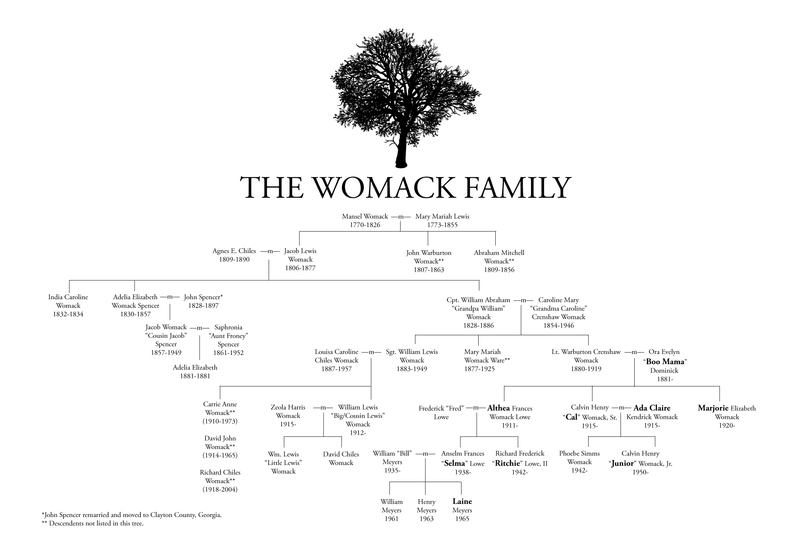 Almost every name in this fictional family tree is a real Womack or Crenshaw family name—however, the top six members on the tree are real ancestors of the Butler County, Alabama Womacks. Mansel, Mary Mariah really had three sons named Jacob, John, and Abraham. Mansel had several other children with his first wife, Sarah, and also with Mary Mariah, but they aren’t relevant to the book and aren’t listed here. 15. Since Althea is partially inspired by my great aunt, I named Althea’s younger sister after my aunt’s best friend Marjorie. 16. Mary Mariah Womack Ware is mentioned in the book, though not by her given name. She is referred to in passing as “Great Aunt Mamie”—Mamie being a nickname for Mary.